Optimum 20-bit Hi-D transfers from the original 1968 master mixes, cleaned and tweaked to a fare-thee-well. This is the best this album has ever sounded. Enjoy the original Triple Grammy-award winning production which propelled the synthesizer to fame and became the first Platinum-selling classical album. Two years ago we assembled a Special Edition Boxed Set of all of Wendy Carlos's Bach and Baroque realizations on the Moog Synthesizer. It was always our intent to give both listener and collector your choice, whichever you prefer: everything together in one place, plus many extras unavailable elsewhere, or the original separate four albums. For those of you who prefer all in one place at a bargain price with all the added extras, you ought check out our page on the Boxed Set. For those who want their Switched-On's and Well-Tempered's more like the way they first came out, just a LOT better sounding and looking, you've come to the right place. This is the cover (which alone took two weeks of work to reconstruct) and presentation you remember, with additional remarks seen from the perspective of over three decades later. The sound is again in meticulously preserved and restored ultra hi-fi 20-bit audio. Don't confuse this album with any earlier releases. The audio on them was at best two more analog tape generations away from the original master mixes we returned to for these deluxe editions. You can hear these historical breakthrough recordings as they've never been heard before. We think you'll agree it was well worth the wait. Switched-on Bach was released at the end of 1968 and became an immediate success. It was acclaimed as real music by musicians and the listening public alike. As a result, the Moog Synthesizer was suddenly accepted with open arms by the music business community. We witnessed the birth of a new genre of music--classical music, realized with impeccable musicianship on synthesizer and tape recorder. Now, some three decades later, the electronic music medium has evolved into a mainstream musical tool. Sixteen-track and twenty-four-track recorders came to be widely used after the release of Switched on Bach, and then digital synthesizers, hard disk recorders, and computer-based music production systems. Wendy's contributions to this evolution cannot be overstated. She has realized a wide range of high quality music, set ever-increasing standards for sound synthesis, developed a significant body of alternate tunings, and generously provided her usual perceptive advice to equipment manufacturers. Her four Bach/Baroque albums, specially remastered for this release, are major milestones in the evolution of electronic music. At the same time, each album stands by itself as an important contribution to our classical music tradition. I'm delighted to witness the re-release of these works, as are countless numbers of music lovers throughout the world. As this is written it's been 33 years since Switched-On Bach was first released. At the time electronic music and sound synthesizers were genuinely new territory, topics that were not generally known about by most people. If electronic music was thought about, it was in terms of "bloops and beeps", the usual style of most contemporary music at the time. The world of "serious music" was deeply in the hold of a narrow range of acceptable musical styles that prescribed a difficult, nearly always ugly result. So I was not surprised that when these same composers used electronics to create new music, the results had little to offer in the way things I loved: melody, harmony, rhythm, and so much more. I was entranced by the new tools, and could see that this was a ripe new method of making musical sounds, no more nor less. This medium did not always force the electronic music of the 50's and 60's to be dry and narrow, although earlier it wasn't easy to impart much expression. By 1968 we stood at one of those brief junctures in history in which breakthrough means, curiosity and motive come together, perhaps in a collision. I'll always be grateful that I was allowed to be there and play a small role in this particular shift of paradigm. When we started S-OB my goal was to demonstrate that I could make "real" music with Bob Moog's marvelous new synthesizer. Then I could "get on" creating my own music with it. This modest idea was the reason for selecting a respected, well-known repertoire for the project, "Bach's Greatest Hits," in fact. His music was ideal in several ways, as we've said before: it was contrapuntal (not chords but musical lines, like the Moog produced), it used clean, Baroque lines, not demanding great "expressivo" (a weakness in the Moog at the time), and it was neutral as to orchestration (Bach freely used many variations on what instruments played what). I've tried often since then to tell the stories behind those albums. Most recently, in the "Switched-On Boxed Set", you'll find the most extensive chronicle, all the details folks had been driving me crazy about for years, questions and curiosities. For the full details get the boxed set. But this album is the definitive edition of just Switched-On Bach, like you asked for, with the original cover, artwork and notes, cleaned and tweaked to look better than ever before. The audio has also been carefully cleaned and polished, starting with the original final mix tapes, never heard before these new deluxe remasterings. A lot of time and work went into these albums, we hope they will give you years of pleasure! Switched-On Bach was recorded originally on a custom 8-track 1" (Ampex 300/351) tape machine, then mixed to stereo premasters using a two-track 1/4" Ampex. The mixes were edited and transferred using equalization and level optimization to the final masters, using Dolby A. For this new edition we began with the first generation premasters. The standards today do not require most of the EQ and gain riding steps used in 1968, so only the main levels were matched to the original releases. This meant we could make an optimum Hi-D 20-bit transfer, and perform these basic adjustments all within a 24 bit environment. From these definitive transfers, a release master was next prepared. All tracks were meticulously fine-tuned, cleaned and optimized over a period of several weeks, as with the other ESD masters in this series. You may rest assured that this is the best these recordings have ever sounded. This Special Edition of Switched-On Bach was assembled by Wendy Carlos. Graphics layout, creative design and supervision by Chika Azuma. All texts and photos (except where noted), illustrations, image processing, audio engineering and CD mastering by the composer. With a special thanks to Bob Moog for his generous comments and permission to print the original Moog logo, to John Romkey, for computer equipment and frequent support, to Clare Cooper for assistance during master transfers, to Chris & Todd & Georges @ Arboretum Systems, and Eric Klein @ Waves, to Joe Winograd and Gabriel Lawrence @ Aris for MusiCode support, to Drew Miller@ ESD for the Enhanced-CD file assembly and HTML editing, and to ESD's Rob Simonds for thoughtful suggestions, feedback, and executive support. Wendy Carlos's integration of classical music with modern technology created the 1968 classic, Switched-On Bach, a Grammy-winning album that became one of the biggest selling classical recordings of all time. The blending of Bach's chorales and concertos with the Moog synthesizer proved that the electronic musical instrument could indeed be used for soulful and intricate performance and composition. Not only was this recording the first in a series of well received synthesizer recordings from Carlos, it also inspired dozens of "Moog" albums from other performers, each one attempting to use the synthesizer for everything from Beethoven to The Beatles. In 2000, Carlos released a four-CD package, Switched-On Boxed Set, which contained S-OB and three of her related LP's. For those who could not afford the price of a four-CD box set with 200 pages of liner notes and an ornate box, Carlos has reissued both Switched-On Bach and its follow-up, The Well-Tempered Synthesizer, on single discs (while Switched-On Bach has been released on CD before, The Well-Tempered Synthesizer makes its debut as a CD solo release). The discs retain the clarity and freshness of the original master tapes -- compared to the original vinyl editions, the clarity is much better -- one can hear the tiniest nuances in pitch and oscillation that were originally masked in the earlier analog versions. The boisterous "Sinfonia to Cantata #29" is more striking and joyful than ever before, and Carlos's interpretation of Bach's "Third Brandenburg Concerto" has more depth and inventive interaction between synth-woodwind and synth-brass creations. Carlos' second disc was the acclaimed follow-up to Switched-On Bach, The Well-Tempered Synthesizer (whose title is a reference to Bach's "Well-Tempered Clavier"). On this disc, Carlos and producer Rachel Elkind bring more of Bach's compositions and concertos into the electronic world and add classical masterpieces such as Handel's "Water Music" and four Scarlatti sonatas. One can hear both the evolution of the synthesizer as an accepted musical instrument and Carlos's attempts to find new and unique ways to make the synthesizer do more than just beep and buzz. The two discs also contain narration and discussion from Carlos on her recording techniques and experimentations. The liner notes contain not only the original texts from the vinyl album covers, but also some selected observations that appear in Carlos's Switched-On Boxed Set texts. Both Switched-On Bach and The Well-Tempered Synthesizer are enhanced CD's -- the discs contain a snapshot of the www.wendycarlos.com Web page as well as links to East Side Digital, the company currently scheduled to release more of Carlos's albums in the future. If you want to prove to someone that electronic music did not begin with Brian Eno or Trent Reznor, buy them a copy of Switched-On Bach and watch their eyes light up in amazement. Since Wendy Carlos unleashed "Switched-On Bach" upon an unsuspecting world in 1968, her Moog synthesizer orchestrations have been hailed variously as a watershed in electronic music and as a passing novelty. Certainly, three decades later "Switched-On" classics have become a cliché, and the synthesizer itself is now simply part of our contemporary sonic fabric. That leaves the music-making itself to be judged. Carlos' renditions remain the platinum standard of their ilk, not because she replicated the sound of a Baroque orchestra but because her own orchestral palette was so unique: Her "instruments" huffed, wheezed, and clanked like an intergalactic music box -- and yet under Carlos' hands, they illuminate the contrapuntal magic of Bach and his contemporaries as if their intricate mazes were formed in midair. 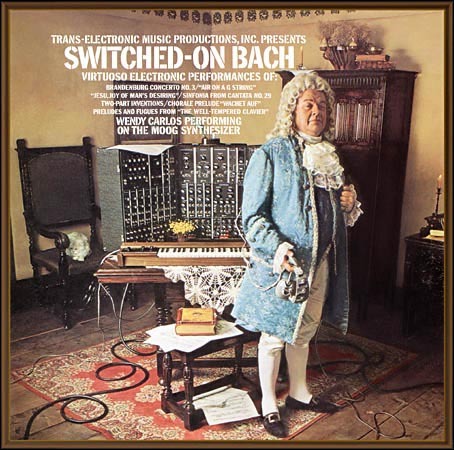 The "Switched-On Box Set" includes all four of Carlos' electronic Bach and Baroque albums released on Columbia, from the original "Switched-On Bach" in '68 to the final "Switched-On Brandenburgs" in 1980. The scrolled and bordered artwork of the boxed set reinforces the ironically antique image of the music, while two booklets (totaling nearly 200 pages) include the original liner notes and more background information than you could ever desire. Plus, Carlos throws in an enhanced CD with extra info and a virtual synthesizer to boot. As you know from my enthusiastic review of Wendy Carlos's soundtrack for Stanley Kubrick's Clockwork Orange, Sonic Seasonings, and Tales of Heaven and Hell (Sept/Oct 1999), I grew up listening to her amazing music and artistry--you might even say it shaped a lot of my earliest thoughts about what musical performance was and could be. Switched-On Bach was one of the first classical albums I ever heard, and I heard it long before I had heard Bach on conventional (let alone period) instruments. Carlos's brilliant transcription of Bach's Sinfonia for Cantata 29 blew me away. For a long time I couldn't listen to anything else on the record. But soon I savored the rest of the disc as well: varied and ever-fresh realizations of the 'Air on the G String', 'Jesu, Joy of Man's Desiring', the inventions in F, B-flat, and D minor; the E-flat and C-minor preludes and fugues from WTC I; 'Wachet auf'; and the piece de resistance, Brandenburg 3. Wendy Carlos started me on a lifetime of loving and performing Bach as well as a continuing desire to study and make electronic music that retained a sense of tonality and expressive immediacy. Over the years, some of Carlos's Bach recordings were reissued on CD, and they always left me feeling a bit disappointed. The sound wasn't as lustrous as I remembered, for one thing; what's more, my favorite installment in the series--the superb Well-Tempered Synthesizer -- never appeared in the new medium except for brief, tantalizing excerpts on the now-deleted Sony disc Secrets of Synthesis. And while I never lost my love or respect for Carlos or her work, bringing it up in classes and in conversations whenever I could, I wondered if perhaps my unabashed affection for her achievement might have been more the product of youthful inexperience, a kind of musical "puppy love". Well, having devoured these completely remastered treasures--both volumes of Switched-On Bach, the remaining Brandenburgs, and, of course, The Well-Tempered Synthesizer -- I've concluded that my first impressions were absolutely right. Wendy Carlos is a cultural icon of the same magnitude as Leonard Bernstein and Glenn Gould: all three were artists whose personalities and vision changed forever the way we heard and thought about music. For those who come new to the Carlos experience, let me list the contents of the four discs. The first, Switched-on Bach, contains the works I have already mentioned. Next is the Well-Tempered, which has Brandenburg 4, four Scarlatti sonatas (K 455 in G, K 491 and 96 in D, and K 531 in E), three excerpts from Handel's Water Music (the Bourrée and Air from the F-major suite and the Hornpipe from the D-major one), and two Monteverdi tracks (a suite fashioned from a few instrumental and choral pieces in Act I of Orfeo and the grand opening motet from the Vespers, 'Domine ad adjuvandum'). Switched-On Bach II has the Badinerie, Minuet, and Bourrée from Bach's orchestral suite in B minor, the Inventions in A and A minor, 'Sheep May Safely Graze,' four little pieces from Anna Magdalena's Notebook (including a heart-rending 'Bist du bei mir'), and Brandenburg 5. Finally, the Switched-On Brandenburgs has the first, second, and sixth concertos. The remastered discs have a few bonuses: tracks narrated by Carlos that include tests and rejected arrangements and the transcription of the Little Fugue in G minor (originally on the Columbia By Request album), included here so that all the Bach pieces are in one place. And there's more: the fourth disc includes a computer demo of "a virtual analog synthesizer" and many photographs (accessible via CD-ROM drives). The original notes from the albums are collected in one booklet (Benjamin Folkman's liner notes for the first album are still some of the best I have ever read) and a larger booklet includes remarks by Robert Moog and lengthy historical and technical essays by Carlos. There's absolutely nothing here to discourage buying this amazing set, so I'll just comment on some of the many highlights. The four Scarlatti sonatas--in particular, K 455 -- are amazing because of their innovative treatment. First, the musical lines rapidly change position in the stereo image -- from hard right to left and back; second, Carlos uses multitrack recording to double certain notes in the musical lines with different timbres and percussive white noise--the result is a rich sounding and dramatic rehearing of Scarlatti's visceral sonatas that, quite frankly, is more exciting than the originals can ever be. Carlos is a composer as well as a performer and audio professional and shows her uncanny sense for just the right timbres in her realization of the E-flat fugue from WTC I; the three-part contrapuntal web has more clarity than would be possible on a keyboard instrument (not to mention more lively ornamentation). And again Carlos changes the sounds subtly to reveal the work's structure and maintain expressive variety: the subtle doublings of white noise near the end are both clever and elegantly comic. I spend a lot of time talking about the sounds themselves because I find them so amazing and fresh, but rest assured the performances are no less impressive. Carlos's interpretations are vivid, loving, full of variety. Listen to the exciting finale to Brandenburg 5 and the lyric, almost melancholy, version of Wachet Auf David Moore talked about Carlos's new version, Switched-On Bach 2000 for Telarc (Jan/Feb 1993); I don't believe American Record Guide covered the earlier, inferior CD re-releases. Carlos's Switched-On Bach Set is an historic recording in the very best sense. This re-release of Wendy Carlos' early recordings has been long awaited. At last, these treasures are available in this wonderful boxed set. Wendy Carlos went back to the original master tapes for this collection, producing the most clear and detailed versions yet released. The results are amazing, with sounds and nuances that were not audible on the LP's or early cd releases. And for the very first time on cd, "The Well-Tempered Synthesizer", which is, in my opinion, the most beautiful electronic creation of classical music ever produced. I hadn't heard this release in a decade and hearing it again now took my breath away. There are bonuses on each cd, for example, the Little Fugue in G Minor and the alternate second movements for Brandenburg Concerto No. 3. Also, included are some tracks of Wendy Carlos' narrative explaining the evolution of some of the works, overcoming technical problems, etc. It is a delight to hear, in her own charmingly New York accented voice, the genius behind these incredible recordings. The boxed set also includes an extensive book with photographs detailing how each recording evolved, her production partnership with Rachel Elkind, the evolution of her unique and impressive Moog Synthesizer and recording studio and other personal details providing great insight and interesting reading. A detailed description of the Moog Synthesizer modules, with photographs, is fascinating. The boxed set is an exciting reward to all the loyal fans who have been waiting for these precious recordings to be available on cd. And as one of those long-time fans I can't express my enthusiasm too strongly. "Wendy Carlos is the original synth," her logo proclaims. It's a crown she rightfully claims as creator of Switched-On Bach and three other revolutionary albums of baroque interpretations played on the Moog Synthesizer. Released in 1968, Switched-On Bach quickly became among the best-selling classical albums of all time. Carlos proved that electronic music was not merely blips and bloops. With the help of Robert Moog and producer Rachel Elkind, she created real music with a fresh sound. This boxed set contains the original S-OB recording, plus The Well-Tempered Synthesizer (which includes selections by Monteverdi, Scarlatti, Handel, and Bach), Switched-On Bach II, and finally, from 1979, Switched-On Brandenburgs. Over the years, the albums were released in different formats but never remastered for optimal sound quality -- until now. Carlos recently regained rights to these albums, and she spent months of painstaking restoration (including rebuilding the original tape recorders) to take advantage of the dynamic range available on CD. The result is simply breathtaking. The sounds seem to spring from the speakers. Here we are, some 30 years later, and these recordings still sound revolutionary. As novel as the sounds are, Carlos's interpretations are also genuinely bright and lyrical, especially considering the tedious process with which she created and layered the sounds. Garbed in Moog electronica, Bach's genius shines as brilliantly as ever. Carlos sets the lively pieces dancing and imbues the slower movements with nobility. Two booklets are special features of this box set. The first gathers together the entertaining liner notes from the original albums, while the second 142-page illustrated book delves into the music's history, the inner workings of the Moog units and keyboards, the studio setup, and key participants in the projects. Two tracks offer narration by Carlos and musical examples of the composing process. The fourth CD contains an Enhanced CD feature with high-resolution photographs, virtual wendycarlos.com website, and a demo of an analog synthesizer. This definitive edition illuminates an important chapter in the history of music -- and best of all, it sounds better than ever. WHILE MANY SO-CALLED Internet visionaries suggest that digital downloads will revive the single as the most popular music format, artists continue to set their sights on creating the perfect album. Since the dawn of rock and roll, many musicians have viewed the full-length record as a variant on the novel, either writing to a cohesive theme or happily stumbling across motifs as they plow through song after song. We've compiled a list of the 20 albums that shaped the future of music, basing our decisions on their timelessness, influence, and reverberations. 1. Beach Boys, Pet Sounds (Capitol, 1966)--From its groundbreaking arrangements to its heartbreaking harmonies to its shockingly introspective lyrics, this remains the standard for psychedelia, pop, and all points between. 16. Wendy Carlos, Switched on Bach (CBS/Sony, 1968)--A sort of plug for her friend Bob Moog's new invention, this interpretation of Bach masterworks caused a fury among purists, who watched in horror as it became the first classical recording to sell a million copies. The public embraced the warm sounds of the analog synth, and the disc has taken on new levels of meaning as the Moog has gone on to power the krautrock, electronica, and indie-rock movements. It sounds AWESOME!! These first four albums from Wendy have always been classics in my book, and the great job ESD did of remastering combines real history with technology.... I turned up the volume on my JBL studio monitors , and it sounded like a moog would sound coming right out of my keyboard amp.... truly breathtaking. I am part of Valley's Special Markets dept. ( in Connecticut ), and I manage all the Library accounts . You can bet I'll be pushing this selection in the next few months. It really is a great "millennium" purchase, really putting several hundred years of composing, performing , and technology all together into one very experiential cd package . I've done well selling "Tales", and the new "Clockwork" is brilliant as well; it's great Wendy brought all that together. (On a informative note, my bosses brother, Chris Martirano from Kurzweil, gets credit on "Tales" for his assistance to Wendy.) We are indeed fans, and look forward to some excellent sales here. Great Job !! What a remarkable journey these recordings have made, and the end result is nothing short of spectacular! The 4 disks comprising the "Switched on Boxed Set" come with two lusciously narrated booklets describing the synthesizer technology used in the making, photographs and other memorabilia. As for the recordings themselves, having survived baking in ovens, the ravages of various CBS engineering masters and the politics of the commercial record industry, they appear here as 1st generation digital masters recorded in glorious 20-bit resolution by ESD. Some restoration is mentioned and is evident on a couple of the disks. My personal favourite of the quartet, is The Well Tempered Synthesizer (W-TS), which I believe represents the culmination and maturation of the disk which was chronologically before it, the original "Switched On Bach", or "The Electronic Bach". Switched on Bach II and the Switched On Brandenbergs are less satisfying for me after hearing W-TS, but interesting none the less. Background hum and key clicking have been kept to a minimum and there are rare occasions on all of the disks (except Switched-on Brandenbergs, which was made much later) of oscillator tuning drift. There are some occasions where the oscillators are sharp, but they are never flat. The hum and background noise level on the disks is nothing short of a miracle of restoration by Wendy herself. The noise now on the ESD disks is no worse than your average classical recording made in a Concert Hall. It's certainly superior to the original vinyl titles from CBS. The 20-bit Hi-D process has also brought out nuances in tempo, volume, orchestration and track placement that aren't apparent on the CBS releases. Octave doubling of some parts is revealed for the first time, as are the details of each "stop" or voice of the Moog. What I thought were electronic clicks in several voices was actually the attack envelope of the sound... very resolute! There is only one thing that bothers me about these disks, and it has nothing to do with either ESD or the technology behind these milestones. It is that is in the Air of the Handel Water Music on W-TS contains slow trills which start on the lower of the two notes. In Baroque style it was uncommon to start on anything but the top note. It's only a minor point and there may have been a technical reason when the track was recorded, for this to happen this way. These disks are a fitting conclusion, also a timely release, and in a strange way, a link to the Telarc disk "Switched On Bach 2000", which is a hi-bit digital Dolby ProLogic recording, featuring a re-orchestration and performance of the 3rd Brandenberg Concerto rendered 30 years previously on SOB. All that remains now for the "Switched On" recordings, is for them to be transcribed into multichannel DVD-Audio from the recordings originally recorded in 4 channels. Unfortunately, W-TS and S-OB were originally mastered in stereo only, so DVD-Audio will not benefit them greatly beyond even more resolute recording than the 20-bit Hi-D process affords. Beautifully packed and worth every single cent if you're a Wendy Carlos fan. A proud milestone in commercial electronic music. The rich sumptuous sounds of the analogue Moog, and sensitive interpretations by Wendy, are something to behold when presented this way. In 1968, keyboardist-composer Wendy Carlos released Switched-On Bach, her best-selling LP featuring baroque music performed on the Moog synthesizer. Carlos intended to spread the gospel of electronic classical music through this quirky release; instead, she sold more albums than Karlheinz Stockhausen could ever dream of, released a few follow-ups, and paved the way for Hot Butter's "Popcorn." Carlos has since become well known for more than just these wacky classical interpretations--she recorded the soundtracks to A Clockwork Orange and Tron and released new works--but the "Switched-Ons" are the goofy synthesizer recordings that most of us still remember. Review by: Gary Jacobs (GAJ77702@aol.com) from San Bernardino, Calif.
For fans of Wendy Carlos, this compilation of early synthesizer works is a godsend. In these groundbreaking and in some ways still unequaled recordings, Carlos showed the Moog indeed was a musical instrument of great range and nuance. The remastering is impressive when compared to earlier CDs and, of course, LPs. Get one for yourself, another for a friend. What this box set proves, once and for all, is that Wendy Carlos's synthesizer recordings of Bach and others are no novelty: they're great performances in their own right, often better than those using traditional instruments. And what could serve her work better than this lavish, more-than-complete set? Get one for yourself and one for each of your enlightened friends. You'll be glad you did. Way to go, Wendy! Wow! Switched-On Bach still has the magic, after all these years...! I doubt you could find any compilation anywhere that would even come close to the value that this set presents. Newly remastered versions of all four of Carlos's incredible baroque Moog transcriptions, all of the original liner notes, reproductions of the original covers, extra audio tracks with outtakes from the original albums, and a gargantuan booklet of new notes--plus nearly 35 MEGABYTES of material accessible from a CD-ROM drive. Carlos includes a snapshot of her entire website, pictures of her studio, even the MIDI source for the entire SOB 2000 album (which updated the original SOB selections). All this for less than sixty bucks! Value isn't the only point in this set's favor. This is THE seminal work of electronic music, the recording that launched the entire genre into the public eye. Carlos's orchestration makes classical music fun to listen to again--even if you've heard Bach, Handel, Scarlatti, and Monteverdi hundreds of times, you've never heard them like this. Creative use of stereo and careful attention to synthesizer programming ensure that every part of every piece is distinct and special. You literally cannot do these things with a traditional orchestra. This isn't a replacement for acoustic performances of the classics, but it is an indispensable companion to them. Fans of pure electronic music shouldn't be disappointed, either. These discs are the origin of "phat." Whether you like New Age or Hip-Hop, the sounds and textures in this set should really move you. Carlos worked more than a decade before the TB-303 and the TR-808, but you'll recognize a lot of the sounds in these albums anyway--because they were so good that they became widely imitated instant classics. I wish I could come up with a list of negatives for this set, but I honestly can't. It's true that I like some tracks more than others, but I can't in truth say that any of them are bad. This set is a must buy. When Wendy Carlos released "Switched-On Bach" in 1968, she sent an electric shock through the music world. Young people thrilled to her synthesized interpretations of Bach's greatest hits, while classical fans got their first tantalizing taste of electronica. This set includes all of Carlos's brilliant baroque recreations, painstakingly remastered by the moog master herself. Just as Bach's Brandenburg concertos remain fine examples of music written for a small ensemble, so Wendy's realisations of this music, amongst others, remain fine (dare I say the finest?) examples of synthesizer orchestration. Listen to the superb performances, to the way the melody dances around the stereo image, to how the synthesizer's sounds change every couple of bars &endash; sometimes every couple of notes &endash; in a way that complements the music perfectly. The quality of these recordings is equally fine &endash; it's hard to believe they are all twenty to thirty years old. Wendy's efforts to present the original recordings in the best possible form have paid off spectacularly well. Round this off with the beautifully produced books giving details of the music and the Moog synthesizer together with the enhanced CD-ROM section on CD 4 and you have something no-one who enjoys Bach, Wendy's music, or synthesizers should be without. In 1990, back when I was 14, and an extreme electronics enthusiast, I would spend hundreds of hours in my father's shop, tinkering with different ways to create and design electronic musical instruments. I'm dead serious, this is what I did. Anyway, one day my father comes to me with an old, dusty copy of "Switched on Bach." "You might get something out of this," he says, so I dig up our old turntable and hook it up to my bedroom hi-fi system. My first playing of "SOB" will be forever etched in my mind as one of the all-time biggest musical experiences I am to have. This was all the technical, mathematical electronic theory I had cut my teeth on, merged with the most beautiful music ever composed. From that point forward, and onto a scholarship in Electrical Engineering years later, solderless breadboards and easels would seem the same to me. Such was the power of that scratchy old record. So now I'm much older, having just received the "Switched on Boxed Set" a few days ago, only having given it a few complete listenings, eager to hear it again, and again, and begin digging back into the music that changed my life almost ten years ago. Let me just say that this is an absolute gift to any Bach enthusiast, giving these absolute standards a new interpretation through the glorious old (well NOW it is) Moog synthesizer. Most friends for whom I played the original "SOB" thought it was a gimmick, or Moog advertisement. Maybe this remastering and repackaging will help give it the credit it deserves, as well as open new doors for 14-year old electronic dorks worldwide. For all those who would pretend to conduct with a live soldering iron, let this collection be a gift to you. At long last, Switched-On Bach the way it was meant to be heard. Glorious!!! First Carlos had to reclaim her masters from Columbia. Then she had to digitally clean up and restore the (in some cases) 30-year old tapes. Next she had to design a presentation worthy of these groundbreaking albums. It took a few years and a ton of work, but the result is (dare I say it?) worth the wait. Carlos is to be commended for undertaking this project. Many artists can't be bothered with work done early in their career, no matter how popular it remains. Carlos herself has moved light-years beyond these early transcriptions in her recent work (see "Tales of Heaven & Hell" or "Beauty in the Beast" to see how far). But they were groundbreaking albums, single-handedly moving Bob Moog's cumbersome contraption into the musical arena, changing the face of popular music. And they still stand up surprisingly well musically, too. Since Columbia (whose commitment to the bottom line prevented it) was unable to do them justice, it fell on Wendy to do the job proper. And oh, what a job she has done! This is first class all the way, from sonics to graphics to layout and tons of extras! This is a dream package, not an expense spared, well worth the small investment.